An energy-manipulating Inhuman who is the son of Phaeder and Morga. Phaeder had been a renown scientist on Attilan as well as a high ranking member of The Genetic Council. Phaeder had chosen to defy the council’s decree forbidding the process of cloning. 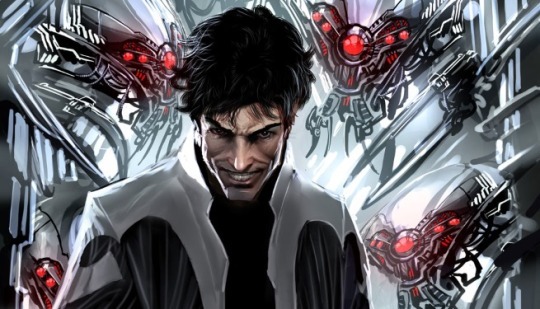 Phaeder illegal experiments were discovered by Black Bolt’s father, Agon, which led to Phaeder’s being imprisoned. Phaeder managed an escape, using a cloned body to fake his own death. He fled Attilan and found refuge among the Deviant race of Lemuria. There he met the Deviant woman, Morga, and the two had a son whom they named Maelstrom. It was against the laws of Lemuria for a Deviant to mate with an outsider and the two had to keep Maelstrom’s paternity a closely guarded secret. Phaeder raised Maelstrom on Lemuria, teaching him all he knew about genetics and cloning. Maelstrom was a gifted student and soon surpassed his father, both in terms of acumen for genetic manipulation as well as disregard for ethics and morality. At some point during his young adulthood on Lemuria, Maelstrom had a relationship with a thus far unnamed Deviant woman. Their brief affair resulted in the young woman becoming pregnant and she went on to have a son whom she named Ransak. Maelstrom did not know at the time that he had a son. Ransak’s having an Inhuman father caused him to look much more human compared to his fellow Deviants; although he was quite handsome by human and Inhuman standards, he was considered freakish and ugly by Deviant standards. This led him to have a very tough upbringing and Ransack went on to become a fierce gladiator in the Deviant fighting pits (and, later, a trusted ally of Thena of The Eternals). Maelstrom’s being the progeny of Phaeder and Morga was ultimately discovered by the Deviant rulers and Morga was put to death for her crime. Phaeder and Maelstrom managed to escape Lemuria. They eventually relocating to the ruins off of the Icelandic coast where Attilan had once resided (prior to it moving to the secluded mountaintop in Tibet). Within these ruins the two discovered a lost cache of Terrigen Crystals that had been left behind when Attilan relocated. Utilizing these crystals, Maelstrom was able to go through Terrigenesis and he was endowed with the ability to absorb and manipulate kinetic energy. This gift enabled Maelstrom to take in such energies and retool it for his own purposes, including energy blasts, the creation of forced fields, strength and durability enhancement, as well as size shifting. Maelstrom was imbued with such tremendous powers that it is likely that Phaeder had somehow manipulated his son’s DNA so that Terrigeesis would bestow him such awesome powers. At some point thereafter, Phaeder was critically injured in a lab accident. Phaeder had previously used cloned duplicates of himself to maintain his youth and vigor, yet he lost the ability to do so following the accident. With his father slowly dying, Maelstrom became enraged and swore vengeance on the Inhumans for having forced his father to live the life of a renegade. Maelstrom devised an intricate stratagem for extracting his vengeance on the Inhumans. First he created a group of minions by developing human clones who he exposed to the Terrigen Mists (the DNA of these clones were altered so that they could successfully transform via Terrigenesis). These minions (which included Phobius, Helio, and Gronk (as well as the cosmic entity known as Daethirge)) were then sent to the laboratories on Hydro-base where they stole a specialized chemical compound that could undo the mutagenic properties of Terrigenesis. Maelstrom then loaded the chemical compound into the warhead of a missile that he fired at Attilan. The compound would be dispersed upon detonation, creating a massive cloud that would undo Terrigenesis for the entire population of Attilan. Fortunately, Black Bolt was able to intercept this missile after it was fired and it was redirected harmlessly into the ocean. Black Bolt tracked the missile back to Maelstrom’s liar where a great battle ensued. During the fight, Maelstrom was exposed to the same chemical he had hoped to subject the populace of Attilan and his Inhuman gifts were undone. Utterly dismayed over his failure and the loss of his powers, Maelstrom fled to his father’s deathbed and requested that his minion, Deathurge, kill them both. Maelstrom’s death caused the creation of new clone of his body in another secret lair. Resurrected, Maelstrom devised a new plan to absorb the energies of The Eternals. With the assistance of The Avengers, The Eternals were able to defeat Maelstrom and his Minions and once more Maelstrom ordered Deathurge to take his life. His death once again caused his consciousness to be reawaken in another cloned body. This led to yet another scheme where Maelstrom attempted to halt the rotation of the Earth so to take in the massive amount of kinetic energy such a thing would create. The Avengers intervened and Maelstrom was defeated. This time, however, The Vision caused Maelstrom’s body to become intangible at the moment that he tried to project his consciousness to a new body. This resulted in Maelstrom’s sentience becoming discorporate and it floated off into the void of outer space. Eventually, Maelstrom’s incorporeal consciousness came into contact with the Titan known as Kronos. From Kronos, Maelstrom learned of the Spirit of Oblivion and somehow he managed to become Oblivion’s avatar, thus regaining his physical form. As Oblivion’s avatar, Maelstrom attempted to bring about the end of existence, a plight that brought him into conflict with the Avenger, Quasar. Quasar was ultimately able to defeat Maelstrom, absorbing his being into his quantum wristbands. Sometime thereafter, Maelstrom escaped and fought against The Great Lakes Avengers, who thwarted his plan to create a devise called ‘the cosmic crunch’ which would do something terrible (presumedly something to do with cosmic and crunching, but who knows?). It was around this time that Maelstrom learned of the existence of his son, Ransak. Discovering that he had a son appeared to quell Maelstrom’s desire to destroy the universe and he caused himself to seemingly shrink out of existence. Later, Maelstrom was encountered by Drax and the new Quasar (Phyla Vell) after they had been transported to the realm of oblivion. By offering Phyla Vell the resurrection of her love, Moon Dragon, Maelstrom was able to trick Quasar into becoming the avatar of death. This was the last Maelstrom has been seen from in quite some time. It appears that he continues on as the avatar of oblivion and it is likely only a matter of time before he shows up once again in one of Marvel’s cosmic titles. An Inhuman diviner who can telepathically communicate with computerized systems over long distances. Mala is never shown on-page, but is rather referred to by Dewoz during a rescue of Inhuman prisoners held at a facility run by the Office of National Emergency. Dewoz noted that Mala’s telepathic powers were deftly overriding the computer systems of the facility, aiding in the Inhumans’ escape. This was Mala’s sole appearance and her current whereabout remain undisclosed. An Inhuman guardsman who was tasked with standing sentry over the chambers containing the Terrigen Crystals. A representative of the Maledicta family has held this position for over twenty generations. It was a largely ceremonial posting in that the chamber was buried deep within the city and no one would dare trespass there without the permission of the Genetic Council. Nevertheless, Goran took his position quite seriously and would not waiver in his duty to guard over the crystals. After the Decimation event where the majority of Earth’s Mutant population was de-powered, Crystal’s husband, Quicksilver, found that he had lost his super speed abilities. Desperate to reclaim his gifts, Quicksilver petitioned the Royal Court to allow him to undergo Terrigenesis. The request was refused in that exposure to the Terrigen Mists (in its concentrated form) was unpredictable for normal humans and could prove deadly. Unswayed, Quicksilver decided to steal the crystals. Goran tried to stop him and Quicksilver murdered him, stabbing him in the heart. Quicksilver’s crime was ultimately discovered and he was banished from Attilan under penalty of death. Quicksilver’s theft of the crystals eventually led to the deadly Silent War event. Following Goran’s death, his brother, Kalib, assumed the post as the new senior guardsman for the Terrigen Chamber. An Inhuman guardsman who was tasked with standing sentry over the chambers containing the Terrigen Crystals. A representative of the Malidicta family has held this position for over twenty generations. Kilib took on the post after his older brother Goran was murdered by Quicksilver. Black Bolt’s maternal grandfather. Magnar married Zeta and together they had two children, a son named Mander and a daughter whom they named Rynda. Rynda would go on to marry King Agon and become the Queen of Attilan. They had two sons, Blackgarr and Maximus. An Inhuman who has thus far only appeared in the alternate reality tale told in ‘What If: Infinity.’ In this reality, Black Bolt struck a deal with Thanos to spare his people, resulting in the near total destruction of the population of earth and dominion by Thanos. The Inhumans remain dominant species on earth, but live in the ramshackle ruins of the human world. Malodor is an illusion-caster who entertains the Inhuman youth with glories tales of The Avengers and the brave deeds of their king, Black Bolt; all while using her illusion-based powers to illustrate her stories. A 616 counterpart to Maldar has yet to make an appearance, but it is possible that her counterpart lives somewhere among the population of New Attilan. The son Magnart and Zeta and brother to the former queen, Rynda. Mander married Azur and together they had two sons, Triton and Karnak. Both Mander and his wife came from prestigious families on Attilan and were considered to have excellent bloodlines. It was expected that Terrigenesis would endow both their sons with powerful and fortunate gifts. When Mander’s elder son, Triton, was exposed to the Terrigen Mists, however, he was transformed into a fishlike humanoid who required a water-based atmosphere to breath. Although Triton would ultimately prove a greatly respected member of the Royal Family, his transformation was initially viewed as freakish and a source of great shame for his parents. So dismayed was Azur over Triton’s transformation that she chose not to have her younger son, Karnak, exposed to the Terrigen Mists (he would eventually undergo Terrigenesis when he was older). Both Mander and Azur’s fates remains yet to be told; whether or not either are still alive and their current whereabouts are unknown. Manto’s current status and whereabout following the War of Kings/Realm of Kings storylines remains unknown. An Inhuman with green skin, elongated fingers and an enlarged, dome-shaped head. Marak was a doctor and the chief pediatrician to the Royal Court. He acted as Crystal’s prenatal care provider during her pregnancy with her daughter, Luna. The pregnancy was complicated, not just because of the mixed heritages of an Inhuman mother and a Mutant father, but also because Crystal, like the rest of the population of Attilan was suffering from atmosphere sickness from the build up of pollutants in Earth’s environment. With the assistance of Reed Richards and the Fantastic Four, Attilan was relocated to the oxygen-rich Blue Area of the Moon… a move that cured the ailing population of Attilan. Afterwards, Richards and Medusa assisted Marak in delivering Crystal’s baby and Luna was born healthy. Marak’s current whereabouts remains unknown. A winged Inhuman with light blue skin, pointed ears, a main of gray-blue hair and two large horns that protrude from her brow. Margoyal was a member of the Royal Guard and was recruited into General Ator’s specialized branch of the guard, The Crimson Cadre. As a member of the Crimson Cadre, Margoyal and her colleagues battled against the Fantastic Four during the Atlantis Rising event when The Genetic Council attempted to abandon the citizens of Attilan so to recreate a new Inhuman civilization on the recently emerged continent of Atlantis. When Ator, Margoyal, and the rest of the Cadre discovered the council’s treachery, they ceased fighting and assisted the Fantastic Four in saving Attilan. It is presumed that the Crimson Cadre was disbanded shortly after Chancellor Arcadius was imprisoned and the rest of the council had perished on Atlantis. Margoyal likely returned to her former post as a member of the Royal Guard and her current status and whereabouts remain unknown. An Inhuman with enhanced strength and durability. She possessed a stout physique, with brown hair, pale skin, and slightly frog-like facial features. Her formidable appearance and brusque mannerisms notwithstanding, Marilla was actually a kind, protective and nurturing individual. She had acted as the governess and court care-provider of the children of the royal family for several generations. She tended for Medusa and Crystal when they were toddlers and later looked after Crystal’s own daughter, Luna. Marilla accompanied Crystal to Avengers’ Mansion during the time in which Crystal served as a member of the Avengers. She took care of young Luna and maintained a playfully antagonistic relationship with the Avenger’s longtime butler, Edwin Jarvis. Although Marilla and Jarvis bickered constantly, it was clear that a friendship and mutual admiration had burgeoned between the two. Sadly, Marilla was murdered by Iron Man during time in which his mind was under control of the villain, Kang the Conqueror. An Inhuman with pink and blue striped skin and tendril-like hair who acted as a handmaiden to Medusa. 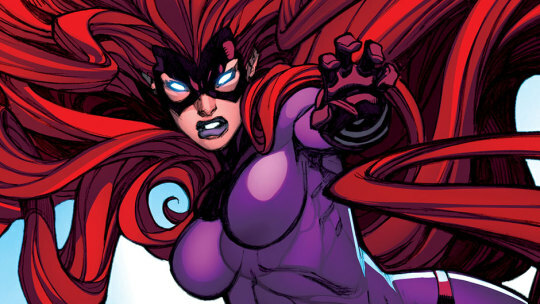 Medusa often confided in Marista about matters pertaining to her relationship with her husband, Black Bolt. Later, following the fall of Attilan during the Infinity Event, Marista became a consult and advisor to Queen Medusa in her new role as the leader of New Attilan. An Inhuman who acted as the chief advisor to King Randak many centuries ago in the early years of Attilan civilization. Randak was greatly interested in the mutagenic properties of the Terrigen Crystals and ultimately chose to expose himself to the mists created when these crystals were broken down. Markoth protested greatly and urged his king to reconsider this decision, stating that it was far too dangerous. Randak would not be swayed, however, and he entered into the chamber of Terrigenesis. While Randak was in the chamber, a Kree Sentry came unto Attilan. The sentry explained to Markoth who he was and the true origins of The Inhuman peoples. Randak then emerged from the chamber, endowed with tremendous powers. The Sentry decreed that Randak’s actions and the positive effects of Terrigenesis on Inhuman DNA proved that The Inhumans were ‘worthy’ and that Attilan would be spared by the Kree and allowed its continued existence. Although Markoth himself never underwent Terrigenesis, selective citizens gradually undertook the process and the tradition continued on until all Inhumans were expected to expose themselves to the mutagenic mists as part of a right of passage when they came of age. Markoth’s ultimate fate remains untold, but it is likely that he maintained his post as Randak’s chief advisor throughout the king’s reign. Maximus Boltagon, the younger son of the former Inhuman king, Agon, and Queen Rynda. Maximus is the younger brother of Black Bolt and second in line of succession to the throne. Maximus was subjected to the mutagenic Terrigen Mists during his early adolescence. This imbued him with powerful psychic abilities, the capacity to read minds, and manipulate the wills of others. The change also augmented his intellectual functioning, bestowing him an uncanny degree of aptitude toward mechanics and the design of ingenious devices. Terrigenesis had no effect on Maximus’ physical form. Initially, his parents believed that his enhanced intellect was the full extent of his powers. Maximus kept his psychic abilities a secret and few suspected that he possessed the ability to manipulate the wills of others. Maximus was a cruel, cunning, and ambitious youngster… traits that became more and more pronounced as he grew older. Maximus felt himself better than others and he had no compunction over using his psychic powers to manipulate those around him and promote his own self-interests. He was especially contemptuous toward his older brother whom he saw as inferior and unworthy of being heir to the throne. With the potentially devastating nature of Black Bolt’s sonic powers, he had to maintain supreme discipline so to not utter a single sound. And Maximus would constantly goad his brother, trying to provoke Black Bolt into breaking his discipline and in so doing prove his unworthiness to be king. These attempts were all in vane, a matter that only acted to compound Maximus’ frustration and disdain toward his brother. As part of a scheme to become ruler of Attilan, Maximus entered into a secret pact with a group of Kree assassins who disguised themselves as peace emissaries from the Imperial Throne-world of Kree-Lar. Black Bolt discovered his brother’s plot and intervened. So to stop the assassins from attacking Attilan, Black Bolt uttered a slight sound, causing a massive sonic boom. The concussive energy from the blast struck Maximus, leaving him with severe traumatic brain injury. Tragically, Maximus was extracting his mental control over the Kree pilot controlling a spacecraft. Effected, the pilot of the ship lost control and it crashed into the royal retreat, killing the brothers’ parents. The neurological injury Maximus sustained acted to grossly diminish his capacity for effective impulse control and left him prone to wild delusions and disorganized thinking. These symptom earned him the moniker, ‘Maximus the Mad.’ Although the injury did not impair Maximus’s impressive intellect, nor did it curb his ambitious scheming. This Trikon was sent to destroy Black Bolt and his precession. Black Bolt was unwilling to uses his sonic powers on the monster, knowing that doing so would devastate the surrounding city. With no other option and all of Attilan at risk, Black Bolt and the other members of the royal family were forced to flee the city. With his adversaries in exile and the Trikon still at his command, Maximus was victorious and assumed the throne as the new emperor of Attilan. Yet Maximus proved to be an unpopular king among his people. Concerned over the calls for the return of Black Bolt, Maximus sent agents to search out his brother so to destroy him. Maximus also began work on his ‘Atmo-Gun,’ a device that was designed to send a toxin into the atmosphere that would kill all human life on earth. The Inhumans lived in fear of being discovered by the humans and Maximus believed that extinguishing this threat would finally win him his people’s favor. Seeking out his brother ended up being a costly mistake for Maximus. Black Bolt returned to Attilan accompanied by The Fantastic Four. Maximus’ schemes were foiled and, following a tremendous battle, Black Bolt took back the crown. Maximus triggered his Atmo-Gun, but his calculations were flawed and the device did not work. Spiteful and enraged, Maximus activated a powerful negative zone force field that temporarily isolated Attilan from the outside world. The negative zone force field was ultimately deactivated and somehow Maximus managed to flee from Attilan accompanied by his most dedicated minions, relocating to the South American country of Costa Salvador. Maximus encountered The Incredible Hulk while in South America and tricked the jade behemoth into aiding in his schemes. Maximus developed a ‘hypno-gun’ that he used to augment his powers of mental manipulation. The Hulk was eventually able to see through Maximus’ coercion and Maximus was defeated by the combined efforts of Black Bolt and The Hulk. Recaptured, Maximus was sentence to solitary confinement on Attilan, placed in a specialized telepathy-neutralizing prison. Gorgon felt that Maximus’ imprisonment was far too cruel and released him, a kind gesture that proved disastrous. Modifying his former design for the Hypno-Gun, Maximus created a Hypno-Device which enhanced his powers ten fold, allowing him to control the will of all of Attilan. Black Bolt was finally able to break free of this Hypno-Device, but doing so ended up devastating a sizable portion of Attilan. Some time later, Maximus joined the renegade sect of scientists known as ‘The Enclave.’ The Enclave succeeded in capturing Black Bolt’s fiancé, Medusa. Maximus also loved Medusa and objected to The Enclaves decision to execute her. In order to save Medusa, Maximus caused a weapon he was working on to overload and explode. The Enclave was defeated, yet the explosion left Maximus in a death-like comatose state. Black Bolt retrieved his brother’s body and had it placed in a specialized stasis chamber within the catacombs of Attilan. Following Attilan’s relocation to the Blue Area of The Moon, Maximus finally regained consciousness. A great deal of psychic energy had built up in Maximus during his coma and he used this energy to force his consciousness into his brother’s body while trapping Black Bolt’s consciousness in Maximus’ body which remained in stasis. Inhabiting his brother’s body, Maximus ruled Attilan for several months until his schemes were detected and undone by the intervention of The Avengers. Returned to his rightful body, Maximus was moved to a regular prison cell. On several more occasions Maximus used his powers of manipulation to escape his cell and cause trouble only to be defeated time and again. When Ronan The Accuser took control of Attilan, Maximus attempted to rally the Alpha Primitives into an army to repel the Kree occupying forces. Ronan was easily able to suppress this army and, as punishment, Ronan used his universal weapon to banish Maximus to The Negative Zone. While trapped in The Negative Zone, Maximus became involved in the Annihilation War waged by Annihilus who was seeking to destroy all matter. Maximus was ultimately able to return to Attilan. Following two more unsuccessful coups, Maximus was once more imprisoned. The mystical sect of Inhuman monks known as ‘The Pacifiers’ placed a mental spell over Maximus, shackling his manipulative powers so to prevent yet another escape. During the Silent War event, Maximus coerced young Luna to use her own powers to undo this spell. Once freed, Maximus utilized The Inhumans’ war with he United States Government as a means to once more attain rulership over Attilan. This rule lasted until the Secret Invasion event where it was revealed that Super Skrull sleeper agents had infiltrated Attilan. The citizens rallied behind Queen Medusa in her war against the Skrulls and it resulted in Maximus’ conceding the throne to her leadership. Maximus served as Medusa’s aid until Black Bolt returned from The Fault and once more became the king of the Inhumans. Some time thereafter Maximus was once again imprisoned. He was freed by his nephew Ahura and Ahura’s fellow classmates among the Future Foundation (who hoped Maximus would aid them in defeating Doctor Doom). Maximus actually ended up assisting The FF and was since allowed to live freely on Attilan despite his past crimes. It was around this time that Maximus was taken into Black Bolt’s confidence in regards of Black Bolt’s dealings with The Illuminati. Black Bolt elicited Maximus’ aid in defending against Thanos as well as the threat posed by The Builders. Maximus assisted Black Bolt in creating the Terrigen Bomb, a device that dispersed the Terrigen Mists into the atmosphere of earth, thus causing all latent Inhumans to transform by way of Terrigenesis. He also aided the other members of The Illuminati in attempting to fend off the cascading encroachments by alternative realities. Maximus fell in with an offshoot of The Illuminati called ‘The Cabal,’ which sought to destroy the encroaching alternate realities in a much more violent and destructive fashion. At some point after Maximus had joined The Cabal, he turned on Black Bolt and used Black Bolt’s dismay over the approaching end of the world to gain a mental hold over his brother. Once Maximus had this control over his brother’s will he kept him in this state for weeks while galavanting around New York City. The Inhuman security officers, Auran and Nur, were dispatched to track Black Bolt down and they finally caught up with Maximus. Maximus used Black Bolt to kill Auran and escape, but Nur tracked them further and he was finally able to distract Maximus long enough for Black Bolt to break free of the mental control. Black Bolt seemingly killed Maximus, disintegrating his hands with a whisper and casting him off the side of a cliff. Somehow Maximus managed to survive and his hands were in some shape or form regenerated. He rejoined the Cabal in further dealings with the encroaching alternate realities. When all appeared lost, The Cabal fled in a specialized craft that could move through realities. Hurdling through the void, the craft finally came upon Battleworld, the patchwork reality that Dr. Doom had summoned together with the remains of various realities. The Cabal sought to conquer Battleworld, but were soon discovered by Doom who now possessed godlike powers. Stephan Strange sent the Cabal to places unknown before Doom could destroy them. Maximus later showed up as ‘The Prophet’ leading an army of disbelievers who questioned Doom’s godhood. Maximus and his forces were destroyed, but the distraction he provided ultimately helped Reed Richards to make his way to the chamber where the Molecule Man kept Battleworld together. With the Molecule Man’s assistance, Richards was able to reconstitute the 616 universe (an act the effectively resurrected Maximus and many others and returned them all to their former places on earth). Maximus’ status and whereabout following the Secret Wars event had been unknown. He recently resurfaced in the pages of Uncanny Inhumans, sought out by Triton. Triton felt that Tony Stark’s invasion of New Attilan and the abduction of the new Inhuman, Ulysses, had not been properly dealt with by Queen Medusa. Triton saw it as essential to the Inhumans’ future wellbeing that Stark be properly punished; and thus put forward a more overt deterrent to anyone who might seek to harm New Attilan. Triton asked Maximus’ assistance. Maximus agreed and shortly thereafter Stark Tower was destroyed in a massive explosion. A tall Inhuman with pink skin and white hair that shapes like a fin at its crest. She could generate limited spheres of artificial atmospheres around herself and those in her immediate vicinity. Maya was assigned the role of Luna’s nanny because her powers enabled her to create protective spheres around Luna that could shield her from the pollutants of the atmosphere outside of the confines of Attilan. Once a potion was created that allowed Inhumans to survive in the earthly atmosphere outside of Attilan, Crystal had Maya step down and her role of governess over Luna was assigned to Crystal’s former nanny, Marilla (whose temperament and attitudes toward appropriate behavior in children were much more inline with her own). Maya’s current whereabouts remains unknown. Medusalith Amaquelin Boltagon. Queen of The Inhumans and wife of Black Bolt. Medusa was the first child of a pair of Inhuman dignitaries and nutritionists named Quelin and Ambur. Ambur was the sister of Azur who married the former Queen Rynda’s brother, Mander. This made Medusa and her younger sister royalty, cousins to Triton and Karnak and cousins by marriage to Gorgon, Maximus and the prince, Blackgarr. Subsequently, Medusa and her sister Crystal, were raised in the opulent confines of the Royal Palace. Medusa was exposed to Terrigenesis during childhood and the mutagenic mists endowed her with long, flowing red hair that she could control with her mind. Appearing no different from regular hair, these locks actually had the tinsel strength of steel and could be manipulated with the utmost of dexterity. During her adolescence, Medusa would often venture into the confinement center to visit her cousin, Blackgarr. Due to the destructive nature of his powers, Blackgarr (Black Bolt) had to be sequestered in a specialized sound-proof chamber. Although he could not speak, Medusa seemed to be able to understand her cousin, read his body language, and communicate with him. Over time the two fell very much in love. Once Black Bolt gained mastery over his powers and was freed from confinement, he and Medusa became engaged to marry (an engagement that lasted quite a long time, mostly due to the fact that the pairing was not endorsed by the Genetic Council). Following King Agon and Queen Rynda’s tragic death, Black Bolt ascended to the throne and became the new king. Medusa acted as the ‘voice of the king,’ utilizing her great empathy and keen intellect to interpret and relay Black Bolt’s gestures. All this enraged Black Bolt’s younger brother, Maximus, who coveted both the crown as well as his brother’s fiancé. During one of Maximus’s many schemes to wrestle the throne from his brother, Medusa was struck by Maximus’ creation, The Trikon, and accidentally knocked off a sky-sled, falling to Earth. Although she survived the fall, being zapped by the Trikon afflicted Medusa with severe amnesia and she ended up wandering central Europe as a thief. She was discovered by the human super villain known as The Wizard. The Wizard used his technological skills for mind control to maintain Medusa’s amnesia and force her to do his bidding. She joined the Wizard’s team of villains, the Frightful Four, and had multiple run-ins with the heroic Fantastic Four. Meanwhile, Black Bolt searched desperately for his love, leaving his brother to his delusions of being king of The Inhumans. Unsatisfied with just his brother’s crown, Maximus also wanted Black Bolt’s fiancé, and he sent his agents to search out Medusa. This included Gorgon as well as the tracker known as The Seeker. Fortunately, Gorgon found Medusa first. Gorgon was secretly loyal to Medusa. He brought her to Black Bolt and seeing him finally cured Medusa of her amnesia. Aided by The Fantastic Four, the Royal family returned to Attilan and together they were able to defeat Maximus and return Black Bolt to the throne. Similar to her sister, Crystal, Medusa seemed to enjoy adventures in the outside world. She served for a brief time as a member of The Fantastic Four, replacing Sue Storm while Sue cared for her ailing son. Medusa also joined Valkyrie’s all-female super hero team, The Lady Liberators, for a brief time. Following Attilan’s relocation to the Blue Area of The Moon, Medusa and Black Bolt were finally wed. Shortly thereafter, Medusa became pregnant with a son. The Genetic Council were extremely displeased, fearing that the son of Black Bolt might possess overly destructive powers that would threaten the safety of Attilan. They decreed that the pregnancy must be terminated. Medusa refused the decision and ran away to earth along with her sister, Karnak, Gorgon, Lockjaw and her doula, Minxi. After a difficult labor, Medusa gave birth to her son, Ahura. Black Bolt had been conflicted over his dueling needs to serve Attilan and his desire to have a child. He finally found Medusa and was overjoyed to meet his son. Unfortunately, Ahura was born with his significant powers already in bloom. In order to best protect Attilan, the toddler-aged Ahura was taken into the care of The Genetic Council and secretly sent into foster care with an Earth family. He was later returned to Attilan and put into the care of the power-dampening Pacifiers. It all but broke Medusa’s heart; as well as began to create a wedge between Medusa and her husband (a matter that was ultimately exploited by Maximus, still scheming for ways of usurping his brother). Medusa turned to Maximus hoping that he might utilize his mental powers to cure her son. Instead, Maximus used these powers to take over Medusa’s will and stage a coup that left Black Bolt imprisoned and Maximus on the throne with Medusa and Ahura at his side. Black Bolt was ultimately able to free himself and dethrone his treacherous brother. Shortly thereafter, Black Bolt was abducted by the Skrulls and replaced with a shape-shifting Super Skrull who was able to exactly duplicate Black Bolt’s form, powers and psychology. Medusa eventually discovered this ruse and she led an assault on the Skrull war fleet to rescue her husband. They succeed and ultimately entered into a pack with The Kree to defeat the remaining Skrulls. This eventually put The Inhumans into conflict with The Shi’ar who were then led by the vastly powerful mutant known as Vulcan. Vulcan was ultimately vanquished by Black Bolt, but seemingly at the cost of Black Bolt’s life. Believing her husband dead, Medusa became the Queen and new leader of both The Inhumans of Attilan, as well as the remnants of The Kree Empire. Medusa served well as the leader of her people, suppressing threats posed by villains such as The Unspoken and Devos The Devastator. Black Bolt eventually returned and reassumed his place on the throne. In adherence to a celestial prophecy that would protect Attilan, Black Bolt agreed to marry the four queens of The Universal Inhumans (the regents of Inhuman peoples from other planets). Although these marriages are strictly ceremonial, Medusa was quite unhappy over the prospect of having to share her husband in any way. Shortly thereafter, Medusa was asked by Sue Storm to become an instructor and guardian for The Future Foundation while The Fantastic Four are away on a mission. Medusa agreed to the request and joined The FF, bringing her son, Ahura, and niece, Luna, along with her. Medusa had numerous adventures with The FF and eventually returned to Attilan once the Fantastic Four returned to Earth. The schism between Medusa and her husband appeared to widen during the subsequent months. Black Bolt had become increasingly more involved in the dealings of The Illuminati as they attempted to fend off the threat of gradually encroaching alternate realities. Medusa did not trust The Illuminati nor agree with their methods… a matter that was greatly compounded by Black Bolt’s decision not to tell his wife about their endeavors. During the Infinity Event, when Attilan was threatened by the Mad Titan, Thanos, Black Bolt again took actions without consulting with his queen. He had Medusa evacuate the citizens of Attilan while he and his brother triggered the Terrigen Bomb. This destroyed Attilan and its remains fell into the Hudson River between Manhattan and New Jersey. The bomb also created a Terrigen Cloud that triggered a mutagenic transformation of all humans with Inhuman lineage and DNA. Once more believing her husband dead, Medusa again took the throne as queen to her people. She had Attilan rebuilt in The Hudson Bay and offered sanctuary to all new Inhumans created by the Terrigen Cloud. She proved an excellent ruler, repelling threats posed by Lash and the Unspoken, assisting The Avengers in defeating The Red Skull during the Axis Event, and fending off an invasion by Red Ravin and the mutated Inhumans of Aerie… all while juggling the needs of both the new and old citizens of Attilan and negotiating a tenuous peace with the United States Government (unsettled by the advent of a sovereign nation situated right on the coast of New York City). The incredible demands of Medusa’s responsibilities gave her little time to attend to her own needs. Her son, Ahura, had been missing since The fall of old Attilan. Desperate to find her son, Medusa became suspicious that her husband had not died during The Infinity Event and she sent her aids to seek him out, hoping to discover what had become of their son. Black Bolt ultimately did return, having finally freed himself from his brother’s mental enslavement, yet it was not a happy reunion. Black Bolt had hoped that the Terrigen Bomb and its creation of so many new Inhumans would help prepare the Earth from the looming threat of the encroaching realities that he and The Illuminati were attempting to repel. It appeared that he felt his wife needed to be kept in the dark over his dealings, that her ignorance and non-culpability would enable Medusa to be the queen and leader that their people needed. At this point, however, Black Bolt had grown despondent, realizing that The Illuminati could not stop the encroachments and that all of reality was doomed. In a last ditch effort to possibly save their son, Black Bolt had left Ahura in the care of Kang The Conquerer, who might be able to protect him by keeping him in the limbo that exists outside of time. Black Bolt had done this all without awareness nor permission of his wife. It was the last straw and Medusa used her powers as queen to annul their marriage and banish Black Bolt from New Attilan. Black Bolt conceded to her demands, bowed to his queen and left. Medusa had little time to grieve over her love’s betrayal and the dissolution of her marriage. Instead she had to put down a coop orchestrated by the treacherous new Inhuman, Lineage. Following the Secret Wars event, Medusa led a mission to rescue her son from the clutches of Kang the Conquerer. She continued to act as Queen of New Attilan and entered into a romantic relationship with Johnny Storm of The Fantastic Four (much to her estranged husband’s consternation). As queen, Medusa has had to contend with a near constant torrent of crises threatening her people. This has included the advent of the mysterious Sky Spears, the second superhero civl war fought over the new Inhuman, Ulysses, as well as the revolution that the Terrigen Cloud is poisonous to Mutants. This last matter has steadily percolated into a full blown war between The Inhumans and The X-Men that could likely destroy all that Medusa has worked toward. An Inhuman with green skin, a fin of white hair, and reptilian features. He possessed enhanced strength and fierce claws on his hands. Memoth was a guardsman for Black Bolt’s Royal Court and stood alongside his king during an altercation with The Fantastic Four. His current whereabouts remain unknown. An Inhuman who had been appointed the position of ambassador representing Attilan at the United Nations. Exposure to the Terrigen Mists had an odd effect on Mendicus. It halted his aging process and though he is quite aged, he appears no older than a child of ten or eleven. It remains unknown if Terrigenesis also endowed Mendicus with any special powers, but he possesses a keen mind with a special acuity toward the inner workings of politics. Mendicus’ advanced age, coupled with his child-like stature, causes him to tire quite easily. He often uses a bubble-like chamber containing a swirling, salubrious mist that helps him to maintain his constitution and stave off weariness. As ambassador, Mendicus appeared before The United Nations accompanied by his one-time aide, Elejea, and another, unnamed assistant. In response to an attack on Attilan by Portuguese mercenaries, Mendicus demanded that all humans be evacuated from the area surrounding the Inhuman city. This demand was returned with false promises and excuses of protocol. The U.N. was reluctant to fully recognize Attilan due to its violations of civil rights entailed in the maintaining of a slave caste in the form of the Alpha Primitives. His efforts stymied, Mendicus warned that failure to meet Attilan’s demand was sure to result in violence. Mendicus also met with delegates from The United States. These delegates promised support for Attilan, but actually had ulterior motives. They presented Mendicus with a gift, a statue of the American President, Abraham Lincoln. Mendicus accepted this gift and brought it back to Attilan. He was not aware that the statue actually contained a special device, emitting a sonic frequency that would lower Attilan’s defenses. Mendicus’ position as ambassador was dissolved once relations between Attilan and the human world broke down entirely. The situation was ultimately resolved when Attilan relocated itself to a secret local in the Himalayas and the humans were led to believe the city had been destroyed in an earthquake. Following these events, Mendicus maintained a position within governmental structure of Attilan. As the former ambassador to Earth, Mendicus was considered an expert on the matter of human/Inhuman relations. He consulted with the monarchy and the Genetic Council during the Silent War event, warning Black Bolt and the others that the Americans would react violently and decisively to attempts to take back the stolen Terrigen Crystals by force. It is unclear what became of Mendicus during the fall of Attilan during the Infinity event. His current status and whereabouts remain unknown. A latent Inhuman whose powers and transformation were caused by exposure to the Terrigen Cloud. Meruda was bestowed with an enhanced stature and greatly augmented physical strength and durability. He was also empowered with a moderate level of weather control and manipulation; in specific the ability to summon violent sandstorms, gale force winds, and bolts of lightning projecting from his fingertips. Meruda claimed to possess knowledge over arcane magical spells, but any actual evidence of such powers has not yet been shown. As a younger man, Meruda lived in a village in a rural area of the African country of Kenya. At one point he watched as the X-Men, Storm, and her then husband, The Black Panther, were surveying the game park near the village, tracking down a group of illegal poachers. The two heroes were ambushed by these poachers and The Black Panther was captured. Enraged, Storm lashed out with her powers. The anger Storm felt toward these poachers got the best of her and she ended up creating a destructive sandstorm. This storm freed The Panther, by rolled on and ended up destroying Meruda’s nearby village. Meruda was one of the sole survivors. Understandably, Meruda blamed Storm for the death of his family and friends and sought out a vendetta to kill Storm for what she had done. The Inhuman powers bestowed unto Meruda by way of Terrigenesis finally gave him the abilities he needed to seek out his vengeance. So to lure Storm to Kenya, Meruda abducted her cousin Abuya and held her captive. Once Storm finally arrived, she and Meruda engaged each other in a terrific battle. Meruda intimated that he was summoning forth the magical spirit of Gawa, the godly lord of the undead (whether or not he was able to do this remains a matter up to speculation). In the end, Storm was ultimately able to defeat Meruda and a powerful current of wind hurled his body into a nearby riverbank infested with crocodile. It seemed as though Meruda perished, consumed by the crocodile, but it is possible that he managed to survive. An Inhuman from the Marvel Cinematic Universe. Michael lived in the Inhuman sanctuary of Afterlife where he awaited the opportunity to undergo Terrigenesis. Michael had a young son and he consulted with Raina to determine whether or not he or his son would ever get the chance to be exposed to the Terrigen Mists. Raina had recently discovered her powers for precognition and she assured Michael that his son would indeed undergo Terrigenesis, that it would be wonderful and his son would be bestowed the ability to emit an angelic blue light from his body. Michael and his son’s whereabouts following the evacuation of Afterlife remains unrevealed. A latent Inhuman and student at Ohio State University where she was classmates with her fellow latent Inhuman, Ulysses. Terrigenesis was triggered in Michelle following exposure to the Terrigen Cloud. Prior to her transformation, Michelle expressed excitement over the prospect of possibly being Inhuman, amused by the idea that being bestowed super powers could provide a change from what had felt like a boring and dreary life. It turned out that Michelle was indeed an Inhuman, although how she was changed is likely not what she was hoping for. Terrigenesis transformed her into a red-skinned griffin-like being with wings and a tail. She emerged from her Terrigenic cocoon in an apparently agitated state, howling like an animal. She flew off to places unknown and hasn’t been heard from since. An Inhuman who was the mother of Gorgon. Milena and her husband were both arrested for sedition following one of Maximus’s successful coops. Milena’s husband, Korath, instigated a jail break among the political prisoners, but was shot and killed by The Seeker. So to quell any further uprising among the detainees, Milena was sequestered to solitary confinement. After Gorgon feigned allegiance to Maximus, he was allowed to visit his mother in prison. They enjoyed a short reunion before The Seeker shot Gorgon with a stun-ray after Milena divulged the fate of his father. Gorgon was later forced to travel to the human world and search out Medusa in exchange for his mother’s freedom and wellbeing. It is assumed that Milena was freed once Black Bolt retook the throne and deposed Maximus. And her husband’s murder was later avenged when Gorgon battled and killed The Seeker. Milena’s current whereabouts remains unknown. An Inhuman who has acted as handmaiden and advisor to Queen Medusa. She was also Medusa’ s midwife when she gave birth to her son, Ahura. Minxi has the ability to transform into a humanoid version of any animal she comes into contact with. She sometimes takes on some of the more primitive psychological aspects of the creatures she transforms into and often struggles to not act on these more savage instincts. When not using her powers, Minxi possesses a lithe frame, orange skin, darker orange hair and slightly feline facial features. She is considered quite a beauty among the citizens of Attilan and both Gorgon and Karnak have shown romantic interests in Minxi (although she has yet to reciprocate either of their amorous advances). Minxi’s physical appearance has changed a bit over the years and this may have to do with her transformative abilities, the advent of a secondary mutation or (most likely) likely just a creative decision on the part of the illustrators drawing the comics. In the more recent comics, Minxi has been depicted with bright pink skin and long, purple-colored hair. Minxi escaped with the others through the Door of Elldrac during the fall of Attilan in the midst of the Infinity Event. Unlike many of her fellow Inhumans, however, Minxi was not transported very far. She was able to return to the ruins of Attilan on the Hudson and assist in the creation of New Attilan. Together with Elejea and Marista, Minxi has become among Queen Medusa’s most trusted aides. A latent Inhuman whose transformation was triggered by exposure to the Terrigen cloud. Her newfound powers enables Kamala to increase and decrease her size at will. She can also enact this size-shifting ability to specific limbs, allowing her to create giant fists, elated feet, or elongated legs. With a great deal of focus and energy, Kamala can completely shape-shift and change her entire appearance. These powers take up a great deal of energy and, thus far, she can only utilize them for brief periods of time before she becomes exhausted. Kamala grew up in Jersey City. 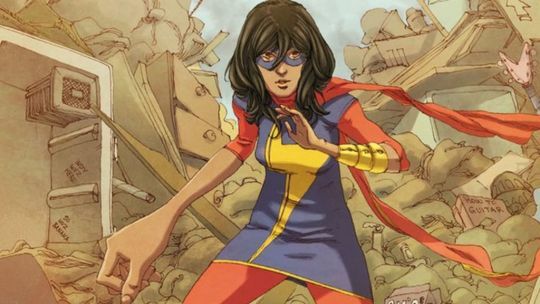 Her parents immigrated from Pakistan and Kamala has often struggled in maintaining a balancing between her parents wishes that she adhere to more traditional Muslim values and her own interests in American popular culture (especially writing superhero fan-fiction). Her best pal is a her fellow classmate named Bruno Carrelli, who runs his family’s corner bodega on the corner near Kamala’s house. Bruno has had a longstanding crush on Kamala, but thus far Kamala has only seen him as a good friend. Recently, Bruno has started dating a young woman named Michaela. At first, Kamala felt oddly jealous over the matter, but eventually came to feel happy for Bruno and also became good friends with Michaela. Kamala’s other good friends include Nakia Bahadir (a fellow classmate who also attends the same Mosque as Kamala and her family); Zoe, a classmate and cheerleader who is not as shallow as she often acts; and Josh, a jock who is similarly a lot more intelligent and sensitive than he lets on. Kamala’s older brother is named Aamir. Unlike Kamala, Aamir is quite strongly devoted to his faith and he often chastises his younger sister for not better adhering to the rules and customs of the tenets of Islam. Although he can be stodgy and dogmatic, Aamir is a good brother to Kamala and very much wants the best for her. More recently, Aamir met and fell in love with a young woman named, Tyesha Hillman. The two have become engaged to marry. Fortunately for Kamala, she really likes Tyesha and the two have become good friends. Kamala went through Terrigenesis when the Terrigen Cloud passed through New Jersey while she and Nakia were attending a party near the Hudson Bay. Immediately after receiving her newfound powers, Kamala knew that a great responsibility had be foisted unto her shoulders. A longtime fan of the super heroes, Kamala quickly decided she needed to use these powers for good and become a costumed hero. Her all-time favorite hero has been the Avenger, Captain Marvel (Carol Danvers), and Kamala initially shape-shifted into Danvers’ form when rescuing a Zoe who had fallen into the bay and was drowning. Kamala later decided that she should become her own hero with her own identity so she created a new costume, but assumed the name of ‘Ms. Marvel’ as a homage to her hero, Carol Danvers. Initially, Kamala believed that her powers were a result of her being a mutant. After sharing an adventure with the X-Man, Wolverine, however, she learned she was not a Mutant and was instead one of the many new Inhumans created by the Terrigen Bomb. Kamala was soon thereafter identified by Queen Medusa as being a new Inhuman possessing great potential (a great potential for heroics as well as a great potential for getting into trouble). Medusa dispatched Lockjaw, the watchdog of the Royal Court, to look after Kamala and keep her out of trouble (although it was more often Lockjaw who needed watching over and protection by Kamala). Kamala and Lockjaw investigated a series of missing persons involving teenagers in the Jersey City area. They discovered that these youths had been abducted by the bizarre villain known as The Inventor. The Inventor held great disdain toward the younger generation and he used his captives as a bio-electric energy-source for his various machines and inventions. Kamila ultimately defeated The Inventor and freed his many captives. Kamala was invited to train at New Attilan so to better refine her powers and abilities. While visiting the Inhuman city, Kamala met a number of her fellow new Inhumans (including Inferno, Naja, and Flint). She also has had adventures with the amazing Spider-Man, Wolverine, and the agents of SHIELD. 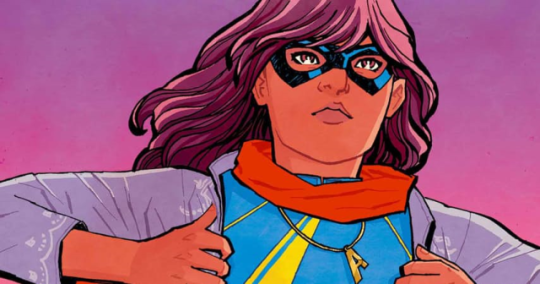 Throughout her early adventures as a superhero, Kamala struggled with feelings of guilt over the fact that she was disobeying her parents and pursuing a secret life her family did not know about. Later, Kamala reunited with a childhood friend named Kamran, who it turned out was also a new Inhuman. Kamila was quite smitten with Kamran, yet he proved not to be as good a guy as he initially seemed. Kamran was secretly in league with the duplicitous Inhuman, Lineage, who used him to lure Kamala into a trap. Like Medusa, Lineage was extremely intrigued by Kamala and certain there was something particularly special about her. Lineage was staging a coop of New Attilan to forward his Inhuman supremacist agenda; and he very much wanted Kamala to join his cause. Kamala refused Lineage’s offer to join him and escaped his clutches. Lineage was later defeated by Medusa and the other Inhumans, but Kamran continued the schemes that Lineage had put in place. Believing that he might find a like-minded ally, Kamran abducted Kamala’s older brother, Aamir, and exposed him to the transformative Terrigen Mists. It turned out that Aamir does not possess an active Inhuman gene and the mists did not transform him. Ms. Marvel, joined by Captain Marvel, arrived on the scene and defeated Kamran, rescuing Aamir.At the onset of The Secret Wars event, where it appeared as though the world was ending, Kamala’s mother admitted to Kamala that she is aware of her double life as a superhero. Kamala’s mother doesn’t entirely agree with this decision, but she is nonetheless very proud of her daughter. Following the Secret Wars Event, Ms. Marvel was recurred to join Tony Stark’s all new, all different group of Avengers. Along with Iron Man, Thor, Captain America, and The Vision, Kamala was joined on the roster by her fellow young heroes Nova (Sam Alexander) and Spider-Man (Miles Morales). Kamala has found Sam to be a bit of an annoyance, but she’s cultivated a close friendship with Miles. Being an Avenger has been a dream come true for Kamala., but the great responsibilities of being an Avenger, maintaining patrols of her local Jersey City, keeping up with her school work, on top of various social and family obligations has left her very much over-taxed and more of then not, quite exhausted. Following an adventure where Ms. Marvel foiled a plot by the sinister Dr. Faustus to take over the minds of a trendy neighborhood in Jersey City, Kamala came to realize that she was being stretched too thin by all of her many obligations. In an effort to navigate around this problem, Kamala and her friend Bruno used a high tech 3-D printer and magical material that had been left behind by the trickster god, Loki, and created multiple drone-like clones of Kamala. Kamala had hoped these clones might sit-in for her at school or during family functions, thus allowing her more time to attend to her duties as a super hero and Avengers. As might be expected, this plot went terribly wrong and the various clones developed their own rudimentary sentience, running amok before amalgamating together into a rampaging behemoth. Ms. Marvel was eventually able to defeat this monstrosity with the assistance of Captain Marvel and Iron Man. More recently, Ms. Marvel was recruited by Captain Marvel to head up a platoon of junior Carol Corps Cadets. Captain Marvel was using the prophetic visions provided by the new Inhuman, Ulysses, to prevent crimes and disasters before they happened. Ms. Marvel and the cadets were put in charge of intervening on future crimes occurring int he Jersey City area. Initially, this plan to intercede on crimes before they occurred was working well and Kamala did not see a downside to the preventative program. When discussing he matter with Tyesha, however, Kamala came to wonder about how this system may be infringing on individual civil liberties. Ulysses’ powers to see the future was essentially a refined process of profiling. Tyesha spoke about how such profiling was used to essentially criminalize entire subsections of the population. She spoke about the neighborhood where Tyesha grew up and how the police utilized profiling as a means to enforce a very racist agenda. The burgeoning doubts Kamala was feeling over the whole matter were further compounded when the young cadets under her charge started acting in an increasingly authoritative and aggressive fashion. The power to essentially change the future had quickly gone to these youngsters’ heads. Ms. Marvel and the cadets were made aware of a vision Ulysses had involving a mass murder at Kamala’s high school. They rushed to the would-be perpetrator’s home to arrest him before he could commit this crime. Much to Kamala’s shock, the culprit turned out to be her good friend, Josh. It turned out that Josh was bereft over the fact that Zoe had broken up with him. He had planned on causing a blackout at his school, yet (according to Ulysses’ vision) doing so would have caused an electrical surge and subsequent fire that would have claimed many lives. The cadets roughed Josh up and detained him to ensure that this disaster would not occur. Although Kamala was glad to have prevented this tragedy, she continued to have doubts over the idea of detaining people without due process or access to legal representation. Her committed to the whole program of utilizing Ulysses’ visions to alter the future was beginning to wain. And she hasn’t been the only one. The entire superhero community has become split over the matter, with roughly half siding with Captain Marvel and feeling that Ulysses’ visions must be used so to save lives, and the other half siding with Iron Man, feeling that civil liberties must be maintained and Ulysses’ profiles of the future are not refined enough to put such absolute faith in. Following the death of The Hulk, the philosophical differences between these two groups came to a head, lines were drawn and hero came to battle hero. Forced to choose a side, Ms. Marvel opted to align herself with Iron Man (even though doing so put her at odds with her mentor, Captain Marvel, as well as her fellow Inhumans of New Attilan). Meanwhile, Bruno attempted to break into the detention facility where Josh was being held. He used a homemade explosive device to get through the main door. The device malfunctioned and blew up right in front of Bruno. Kamala arrived to find Bruno gravely injured. He survived, but sustained paralysis to half of his body. The whole affair caused Kamala to question the methods of the predictive justice program and lose faith in her former hero, Captain Marvel. Ultimately, Kamala left the Avengers and created a new team of young heroes called The Champions. A young Inhuman who came of age during a time in which the Genetic Council held great sway over the governance of Attilan. In adherence with their philosophy of eugenics, the council had instituted a mandate for prearranged marriages. Mojlor was in love with Tally, but their wish to be wed was denied by the council. Instead, Tally was designated to marry Frag because it was believed that their two bloodlines would produce a child for whom Terrigenesis would bare advantageous results. Tally did not love Frag. She loved Mojlor and was heartbroken over being forced into a loveless marriage. Tally took her own life, leaping from a balcony overlooking the city square. What became of Mojlor remains unknown. Lunella Lafayette. A young latent Inhuman who very much did not want to become an Inhuman and went to great lengths to try and prevent her going through Terrigenesis. Lunella is a brilliant youngster who lives with her mother and father on the lower Eat side of Manhattan. Despite her uncanny, genius-level intellect, Lunella was denied admission to the prestigious Future Foundation school (it is likely that her application was rejected because her parents did not feel she was ready to leave home). Instead, Lunella has been forced to endure the often-boring and unchallenging scholastic environment of PS20. At school, Lunella has frequently been teased by her peers and has earned the nickname ‘Moon Girl’ due to her pertinacity to daydream and appear to be lost in space. Unknown to her parents and classmates, Lunella had built a secret laboratory in an abandoned subterranean sewer station. In this secret lair Lunella worked on numerous experiments, creating all sorts of peculiar and ingenious inventions. She additionally studied the history of the Kree Empire’s involvement in earthly affairs. In so doing, Lunella discovered that she possess the Inhuman gene that would cause her to go through Terrigenesis were she exposed to the Terrigen Cloud. Lunella very much did not want to become an Inhuman and she became obsessed with ascertaining a means of preventing her inhuman transformation. To this end, Lunella built a device that allowed her to discover the location of the Kree artifact known as The Omniwave Projector. This Omniwave Projector is a powerful weapon that can generate portals through time and space. Lunella became convinced that the Projector could be utilized to eliminate the Terrigen Cloud and hence prevent her risk of being transformed into an Inhuman. Lunella discovered the whereabouts of the Projector and found it buried near the underside of the Brooklyn Bridge. Before she could utilize the device to attain her goals, however, one of her teachers tried to take the projector away from her believing it to be a toy. In doing so, the teacher accidentally activated the Projector, creating a portal that connected the present with the distant past of a parallel earth (Earth 78411). On this parallel earth, the Projector was in the possession by the neanderthal-like tribe of raiders known as ‘The Killer Folk.’ They called the Projector the ‘Night Stone’ and used it as a weapon in their efforts to subjugate their world. The activation of the Projector created a portal that brought these Killer Folk to Lunella’s world. The heroic creature known as Devil Dinosaur also lived on this parallel earth and he followed the Killer Folk through the portal, seeking revenge on the villains for the death of his former companion, Moon-Boy. All matter of chaos ensued as the Lower East Side was suddenly besieged by marauding cavemen and a giant red tyrannosaurus. The Killer Folk chased after Lunella, identifying that she possessed the Omniwave Projector. Devil Dinosaur interceded, grabbing Lunella by the strap of her backpack and running off. Lunella cleverly used a remote control drone she had built to lure Devil Dinosaur away from the fracas to a secluded part of the East Side. 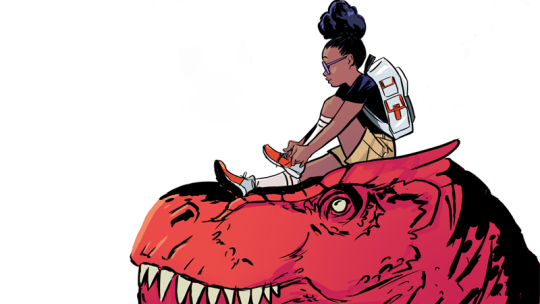 Although Luella was initially frightened by Devil Dinosaur, she quickly came to realize that he was not a threat and was actually a gentle-hearted creature who had protected her from the violent cavemen.The Killer Folk continued to pursue Lunella. Devil Dinosaur was once more successful in driving them off, yet in so doing, his tail inadvertently knocked the Omniwave Projector into the East River. Lunella was incensed, feeling that her last, best chance to prevent her Inhuman transformation had been lost (one of the Killer Folk was knocked into the river as well and he was able to obtain the Projector). Not long there after I fire broke out at Lunella’s school and Lunella was able to direct the lumbering dinosaur to help. Working together, Lunella and Devil Dino were able to save all of the students who had been trapped by the fire. Devil Dinosaur’s heroics notwithstanding, The Hulk (Amadeus Cho) arrived on the scene to apprehend the monster, viewing the crimson creature as a threat to public safety. Lunella pleaded with The Hulk, arguing that Devil Dinosaur was not a threat and that he had saved her and all of the school kids. The Hulk paid her no heed and, after a short battle between the two brutes, The Hulk bested Devil Dinosaur and the creature was taken away. Lunella later discovered that Devil Dino had been incarcerated in a specialized containment cell at the American Museum of National History. Lunella ultimately decided that it was her responsibility to free Devil Dinosaur. The creature had saved her life and she was indebted to returning the favor. Donning a veritable arsenal of home-made gadgets and ingenious, non-lethal weapons, Luella snuck into the museum and successfully freed Devil Dino. The mayhem that followed the escape was photographed by a local journalist and ended up front page news in the next day’s newspaper. The headline referred to Lunella as ‘Moon Girl’ (likely because she was wearing a t-shirt with a picture of the moon on it). The local authorities may have not been able to recognize Lunella under her goggles and headgear, but Lunella’s mother was easily able to identify her and she ended up in serious trouble with her parents, grounded indefinitely. Some time later, Lunella’s mother was accosted by The Killer Folks who had taken over the turf of the former Yancy Street Gang and was terrorizing the neighborhood. The Killer Folk accosted Lunella and her mother once again, this time at Lunella’s school. It was the last straw, Lunella had had it and she used her home-made weapons to drive off their attackers. That evening, Lunella decided it was time to have it out once and for all with The Killer Folk. She and Devil Dinosaur met the cavemen on a rooftop for a final battle. The Killer Folk proved no match for the team of Moon Girl and Devil Dinosaur… the cavemen were thoroughly defeated and Lunella was able to rebooting the Omniwave Projector. This victory, however, came at a great cost. Lunella had been monitoring the movement of The Terrigen Cloud. Her tracking allowed her to secure herself in a specialized, hermetically sealed chamber so to prevent exposure. In her haste to finally deal with the Killer Folk, Lunella neglected to keep track on the T-cloud’s whereabouts and it just so happened that the cloud had drifting over the eastern seaborne and come to lower Manhattan. The cloud surrounded Lunella from all ends and there was nowhere to escape… she tried to hold he breath, but it was to no avail. What Lunella had worked so hard to avoid had finally come to pass. Exposed to the Terrigen, Lunella began the transformation was encased in a terrigenic cocoon. Devil Dinosaur found the cocoon and brought it to Lunella’s secret layer, dolefully watching over it as though it were his egg. Time passed and eventually Lunella emerged from the cocoon. At first, she was quite surprised that she had not changed in any physically discernible way. Her appearance had not altered nor could she detect the presence of any supernatural powers or abilities. Perhaps she hadn’t changed at all… but Lunella wasn’t going to rely on such luck… she saw herself as something of a time bomb: as though some terrible thing could occur at any moment. While some Inhumans emerge from Terrigenesis quite quickly, others can incubate within their cocoon for a very long while. Lunella fell into the later of those two categories and she was actually within her cocoon for several days. Not knowing where she was, Lunella’s parents were beside themselves with worry and were overjoyed and relives when she finally arrived back home. Of course Lunella did not share in this joy, still fretting that her Inhuman powers might come into bloom at any moment, possibly endangering her family and everyone around her. The actually nature of Lunella’s Inhuman powers became evident a few days later when she discovered that her mind and sentience had been transported into the body of Devil Dinosaur (and his into hers). Initially this led to some rather embarrassing events at Lunella’s school where Devil Dino (in Lunella’s body) ran amok. The transference of consciousness seemed to wane in and out… With practice, the two seemed to attain a greater degree of mastery over it. In time, it allowed the two to interact together in a greatly synchronized fashion and the tandem of her brains and his brawn made them a formidable force for super heroics. This led to a brief time where Lunella truly enjoyed herself. The superhero team of Moon Girl and Devil Dinosaur was doing good all over Manhattan, preventing crimes, solving mysteries, and saving lives. All the while, Lunella was being hunted by runaway Kree youngster who thought he could prove himself to his father by capturing an Inhuman. This would-be conquerer is named Mel-Var and he had targeted Lunella under the misconception that she is not especially powerful and would thus make for an easy catch. Lunella had little difficulty fending off Mel-Var (or Kid Kree as he came to be know). Although it took considerably more effort to repel Mel’s father and The Kree Military when they came looking for them. It’s likely that Kid Kree will return before too long to trouble Moon Girl once again. More recently, Lunella completely the Banner Box Assessment Puzzle in record time, leading Amadeus Cho to proclaim her the smartest person on the planet. Morris Sacket. A latent Inhuman whose transformation was caused by exposure to the Terrigen Cloud. Terrigenesis took from Morris his corporal form, changing him into a spectral being who can only take form being possessing the bodies of others. He can take over other peoples’ bodies, leaping into them when they are in his immediate proximity. By way of this possession, Morris gains control of the individual’s physical function as well as absorbs their various skills and knowledge. Morris retains a good deal of this knowledge and skill even after he vacates the possessed body. For instance, if a given individual Morris possesses speaks multiple languages, Morris retains the ability to speak and understand these different languages even after he has vacated the body of that individual. Those whom Morris possesses also retain faint, fading aspects of Morris’ own memories. The formerly possessed are additionally able to see and communicate with Morris in his otherwise invisible spectral form. Prior to his transformation, Morris had been a vastly successful professional basketball player and social celebrity. After becoming an Inhuman, Morris has come to learn that much of his former life was predicated on lies and manipulation. His father and manager has only seemed interested in enhancing his q-rating and longterm earning potential; and his poster girlfriend was actually hired to be with him so to improve her own career and make Morris more attractive to a broader demographic. These painful revelations have been emotionally devastating for Morris and will likely contribute to his willingness to let go of his old life and embrace his new existence as an Inhuman. A latent Inhuman who was transformed by way of exposure to the Terrigen Cloud. Mother Bones possesses enhanced strength and durability. She can increase her size and mass at will and can generate bone-like protrusions about her body that acts as an armor as well as offensive weaponry. Mother Bones was saved by Lash when she was attacked by a mob following her initial Inhuman transformation. She was brought to Orollan where she helped other new Inhumans settle in and learn to control their new powers. She initially seems quite sweet and nurturing, acting as a motherly figure to many of the new residents of Orollan. Yet, when Lash orchestrates an attack on Medusa and The Inhumans of New Attilan, Mother Bones shows a significantly more savage and blood-thirsty side. She took on Gorgon during the battle and proved more than a match for the hulking royal. It is quite possible that she would have defeated Gorgon, but the fight was cut short when Medusa ordered a retreat. Mother Bones recently showed up with a group of Lash’s followers and attacked a Stark facility outside of Zurich, Switzerland (all part of a scheme orchestrated by Maximus). An Inhuman and resident of old Attilan who has green skin and slightly insect-like features. Crystal and Quicksilver had come across a very weary Bruce Banner who, as the Hulk, had been on the run from the military. They offered him sanctuary on Attilan so he might find some rest. Banner had enjoyed his time on Attilan until he came across Mullox and his friend, Entos . Entos held deeply seated anti-human attitudes and he took umbrage with Banner being allowed amnesty on Attilan. Mullox and Entos harassed Banner, stating that a human had no place on the sacred grounds of their city. A foolish act in that Banner finally became so angered by it all that he transformed into the Incredible Hulk and all sort of chaos ensued. This was Mullox’s sole appearance and his current whereabouts remain unknown. King Myran was an Inhuman who lived thousands of years ago. He led the original group of Inhumans who founded the city state of Attilan on an else off the coast of Iceland. He was elected the first king of Attilan. Myran felt quite strongly that maintaining a strictly isolationist existence was the only means to ensure the ongoing prosperity of The Inhuman people, that Attilan should remain secluded from the human world. Ryan’s good friend and advisor, Phadeon very much disagreed with this policy of disallowing contact with the human world. Phadeon believed that the humans and inhumans could learn to coexist and that it was The Inhumans responsibility to help and care for their lessor developed human cousins. Myran and Phadeon’s disagreement over this matter intensified to the point that Phadeon challenged his former friend for the kingship of Attilan. Phadeon’s coop failed and he, his wife and their infant son were all exiled from Attilan. Fadein and his wife perished soon thereafter, but their young son, Tuk, was taken in by a kindly group of humans. Took went on to have numerous adventures (told in a backup feature that was published in the original run of Simon and Kirby’s Captain America Comics). What ultimately became of Myran remains unknown. It is likely that he remained king of Attilan until the time of his death when a successor was chosen.